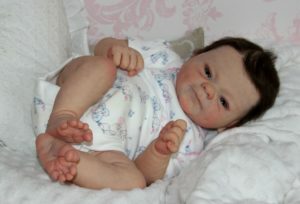 The reborn community can now welcome the first Realborn® Down Syndrome Baby Kit. This little sweetheart is going to be a superb addition to any nursery. Patience is our first Realborn with Down Syndrome. 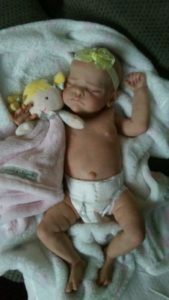 She was captured at the adorable age of 2 months old! Patience has full arms and legs making her perfect for dressing in any outfit. When you purchase this reborn kit it comes unpainted and ready to reborn. She is about 21″ inches long when completed, with a head circumference of approximately 14.5″ inches. 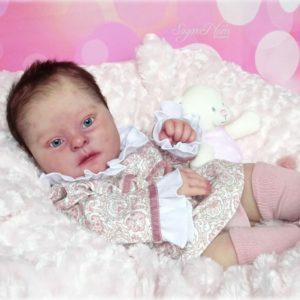 Photos are only to give you an idea of how a completed baby could look. As Patience is an awake baby you will require a set of 18mm eyes for her. The current full price of this kit is $59.95. 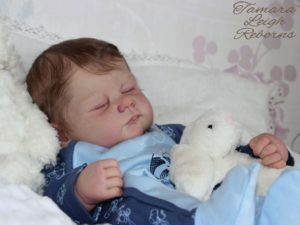 If you love this Realborn® Down Syndrome Baby Kit and want to add it to your collection, use the link provided below to see stock availability.